Disney took to the internet a few moments ago & released the teaser trailer for next summer’s The Lion King. 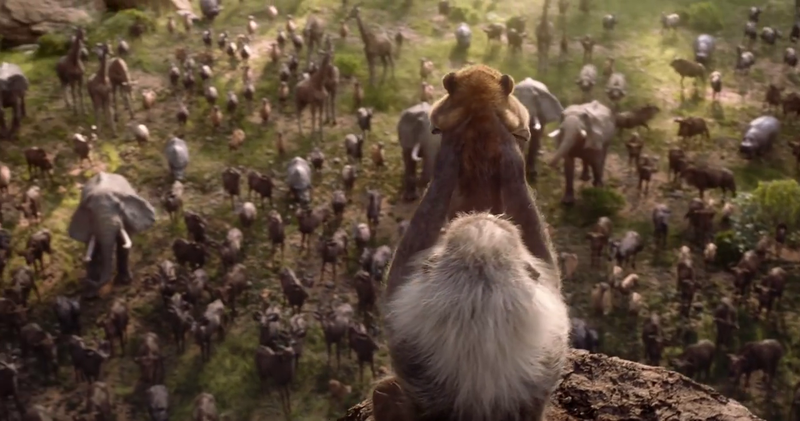 Being that this is only a trailer, we get to hear James Earl Jones’ Mufasa talk to Simba, we get to see baby Simba & get to see a powerful scene that fans of the original film will recognize. Check out the teaser trailer & the poster for The Lion King below! The film stars the voices of Donald Glover, Beyoncé, James Earl Jones, Chiwetel Ejiofor, Billy Eichner, Seth Rogen, John Kani, John Oliver, & Alfre Woodard. The Lion King will be directed by Jon Favrea & will hit theaters on July 19, 2019. The Lion King tells the story of Simba, a young lion who is to succeed his father, Mufasa, as King of the Pride Lands; however, after Simba’s uncle Scar , murders Mufasa, Simba is manipulated into thinking he was responsible & flees into exile. Upon maturation living with two wastrels, Simba is given some valuable perspective from his childhood friend, Nala, & his shaman, Rafiki, before returning to challenge Scar to end his tyranny & take his place in the Circle of Life as the rightful King. Posted in Anime/Manga and tagged Disney.